To the world at large, Galway summons thoughts of one of Ireland’s most idyllic destinations, with rows of quaint shops and pubs leading down to the sea and the Spanish Gate in lanes filled with music, laughter and tourists. Yet, as Conor McNamara notes in War and Revolution in the West of Ireland: Galway 1913–1922 (Irish Academic Press), the rural districts around the city of Galway were scenes of strife, terror and agrarian violence in the years leading up to and through Ireland’s revolution, with primarily young men and women risking all in their bid for freedom against the forces of the British Crown. While the city itself remained largely an enclave of nationalists loyal to the Crown, McNamara offers extensive and in-depth insights into the turmoil which arose in the rural districts, generating a storm of hit-and-run ambushes, assassinations, cattle rustlings and arson. McNamara has written extensively on the rural poor and the revolution and this is his fourth publication on those subjects. In his view, the roots of revolution ran deep for decades before the war for independence, with poor tenant farmers aggrieved by the unfair redistribution of land seized as far back as the 17th century by the forces of Oliver Cromwell. When absentee landlords began evicting tenant farmers in favor of turning their tilled lands over to cattle grazing for higher profits, they created an agrarian crisis that resulted in an enduring wave of “all manner of intimidation, including attacks on property and animals, assault and even murder” against the hated “graziers” and landed class. At the turn of the 20th century, Western Ireland was one of the poorest districts in the country, with many small farmers and the dispossessed forced to hire themselves out as seasonal spailpin workers, slaving for a pittance and living in barns and outhouses far from home; that, or cutting peat from bogs for sale, another brutal task. At the turn of the century, the purchase and redistribution of land was in the hands of an organization known as the Congested Districts Board (CDB), yet often, landowners refused to sell their land. These landowners quickly became the target of labor boycotts, cattle and sheep driven off their land, and shotgun blasts through their windows at night. Some required round-the-clock police protection. The book covers Galway’s role in the Easter Week Rising of 1916, which drew up to 650 rebels, yet was a short-lived fiasco. Organizers had hoped for the delivery of 3,000 rifles from Germany to facilitate a well-armed uprising, but when the weapons failed to materialize the rebels found themselves outgunned with mostly shotguns at their disposal. 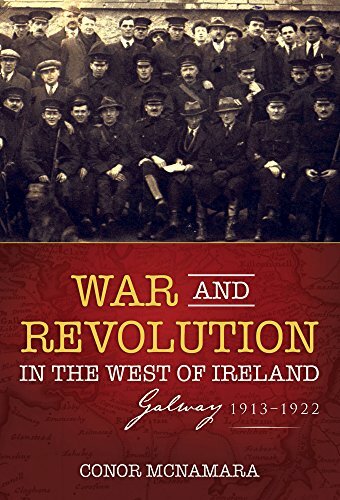 As for the war of independence in 1920-21, McNamara notes that, “Republican violence in Galway involved sporadic attacks against the police and to a much lesser extent, the military, by a relatively small force of active Volunteers . . .” These small bands of guerrillas roamed the countryside, living off the charity of farmers and forever on the run from the Crown forces. Crown forces went berserk in Galway town itself after a police officer was shot and killed. Although the town had mainly loyalist sensibilities and stayed out of the conflict, its citizens suffered a rampage of murder, assaults and the smashing of homes and shops over the course of several weeks. McNamara quotes many reminiscences of volunteers involved in the struggle and offers accounts of seemingly every death and ambush. Missing, however, are the viewpoints of those who served with the RIC and the Crown forces. What was their thinking and justification behind their vicious reprisals? How did they view their adversaries? Did they regret their actions in retrospect? Perhaps his next book will provide some answers. As an American reader with Irish roots, I noted many similarities in “War and Revolution” to other agrarian struggles around the world: for instance, the opportunistic shopkeepers of Western Ireland had their counterpart in the “company stores” of the Industrial Revolution in the United States, and the near-slavery of Ireland’s tenant farmers was mirrored by the sharecropper system in the American South. Then too, the redistribution of land has been a call to arms in Mexico and many other lands; while Galway’s small bands of rural guerrillas call to mind the handful of men who served under Fidel Castro in the mountains of Cuba in 1959. War and Revolution is an old story of agrarian struggle told from a new perspective, offering many thought-provoking insights into the role of small farmers and rural society in the quest for economic justice in a world that is often callous and indifferent to their needs. Robert Downes' debut novel, Windigo Moon: A Novel of Native America, is a finalist for the 2017 Foreword Indie Book Award for Historical Fiction. He is also the author of books on travel and the outdoors such as Planet Backpacker: The Good Life Bumming Around the World and Biking Northern Michigan.